Do you want to enhance your adult coloring and artwork experience with this Perfectly Designed WaterColor Pencil? Upgrade Your Art Experience Now! - Have you been wasting too much time having to SHARPEN your watercolor pancils? - Is the lead breaking too easily making you change pencils constantly? - Are you sick of having too press too hard to get color? - Are you tired of using pensils that have no PIGMENT? Introducing Your Very Own Free Art Water Color Pencil to the Rescue! 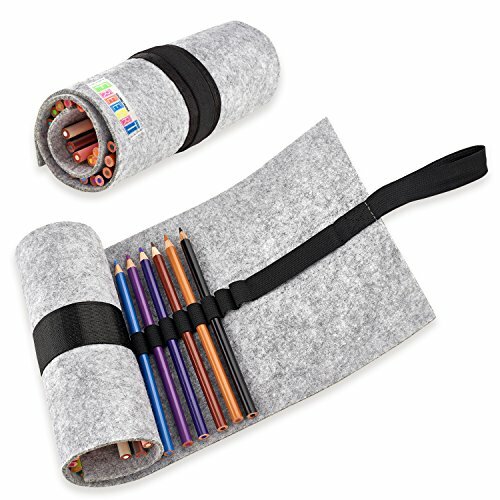 - Designed to be strong, sturdy, and give you years of enjoyment - Made of Lightweight, 3.5 inch basswood that is meant to last - Colors are highly pigmented and bring your projects to life - Wool felt carrying bag helps keep your investment dry and dirt free - Comes in set of 24 different colors Amazon Buyers Trust Our Free Art Brand to be Quality Premium Products You are backed by Our Lifetime Warranty too! We Cannot Guarantee this Special Pricing, So Be Sure to Click Buy Now! HIGHEST QUALITY COLORED PENCIL TO CHANNEL YOUR INNER PICASSO: Our thick, strong and durable lead gives you super confidence with a perfect tool for coloring. MOST VIBRANT, BRIGHTEST, AND SMOOTHEST COLOR LAY DOWN: 24 amazing color pencil set contain a wide range of vivid colors that bring art projects and drawing to life. PERFECT FOR ADULT COLORING BOOKS: "These are the best adult coloring pencils! Bright, strong, and bold. Great color pencils set for my Secret Garden Coloring Book." BEST FOR SCHOOL OR ANY ARTWORKS: Our drawing colored pencils is not only for adults, but also for kids. It's an essential tool to stimulate children creativity in the classroom. 100% SATISFACTION GUARANTEE - We are so confident that you are going to love our colored pencil set. If in any way you don't love your colorful pencils, we'll give you a full refund ASAP. If you have any questions about this product by AIGEREK, contact us by completing and submitting the form below. If you are looking for a specif part number, please include it with your message.